Nerve conduction velocity (NCV) is a test of the speed of conduction of impulses through a nerve. The nerve is stimulated, usually with surface electrodes, which are patch-like electrodes (similar to those used for ECG) placed on the skin over the nerve at various locations. One electrode stimulates the nerve with a very mild electrical impulse. The resulting electrical activity is recorded by the other electrodes. 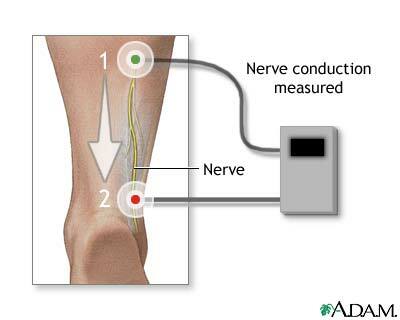 The distance between electrodes and the time it takes for electrical impulses to travel between electrodes are used to calculate the nerve conduction velocity. Electromyography is often done at the same time as the NCV test. Normal body temperature must be maintained (low body temperature slows nerve conduction). The impulse may feel like an electric shock. Depending on how strong the stimulus is, you will feel it to varying degrees, and it may be uncomfortable you. You should feel no pain once the test is finished. Often the nerve conduction test is followed by electromyography (EMG) which involves needles being placed into the muscle and you contracting that muscle. This can be uncomfortable during the test, and you may feel muscle soreness at the site of the needles afterwards as well. This test is used to diagnose nerve damage or destruction. Any peripheral neuropathy can cause abnormal results, as can damage to the spinal cord and disk herniation (herniated nucleus pulposus) with nerve root compression. There are essentially no risks. A NCV test shows the condition of the best surviving nerve fibers and may remain normal if even a few fibers are unaffected by a disease process. A normal NCV test result can occur despite extensive nerve damage.